Milton Walsh holds a doctorate in Sacred Theology from the Gregorian University in Rome. An expert on Knox's writing, he is the author of Second Friends: C.S. 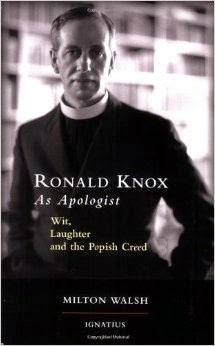 Lewis and Ronald Knox in Conversation and Ronald Knox as Apologist: Wit, Laughter, and the Popish Creed. Both titles are available through Ignatius Press. 1) How did you come upon the writings of Msgr. Ronald Knox? What kind of role has he played in your life, both spiritually and theologically? I first came across the writings of Ronald Knox in high school, in the late 1960s. I was in the minor seminary at a very tumultuous time in the Church and society, and with like-minded friends began exploring the writings of men like Newman, Chesterton, C. S. Lewis, Arnold Lunn, and Ronald Knox. From that time on they have been constant sources of spiritual and intellectual refreshment. A few years after I was ordained a priest, my bishop sent me to Rome for doctoral studies. I had hoped to concentrate in spirituality, but he asked me to devote my energies to apologetics. This was in 1982, and the word had all but dropped out of the Catholic lexicon. He foresaw that in the future we would need people trained in presenting the Catholic faith in a clear, attractive way. Knox was, of course, my model for this, and I did my doctorate on his approach to apologetics. Many years later I re-worked the dissertation for the general reader, and it was published by Ignatius Press as Ronald Knox as Apologist. I have also found Knox to be a sympathetic spiritual guide and a model for preaching. His sermons were always biblical, imaginative, and intellectually stimulating … and delivered with a lightness of touch and occasional humor. I think any preacher would do well to make Knox’s sermons regular reading. 2) As a high school theology teacher, one of the classes I teach is Catholic Apologetics. In the class, we utilize Knox's In Soft Garments, which is a collection of lectures Knox gave to Catholics attending Oxford in the 20's and 30's. For many, Knox is known primarily as the convert who became an eminent apologist for the Church. Yet, as you have pointed out in your book Ronald Knox As Apologist, that towards the end of his life he saw a need for a new kind of apologetics. His death in 1957 left that an open question. So, what do you think he was aiming at in this new apologetics and how might that be applicable to the Catholic Church in 2015? I’ll try to give a brief answer to a question which generated an entire dissertation! Knox did “classical apologetics” very well, and his Belief of Catholics is still a good resource for those who want a popular intellectual defense for belief in the existence of God and the unique role of Christ in human history. This apologetic approach was the heir to the Enlightenment, and tended to put great emphasis on rational argumentation. Reason was seen to be the common ground between believer and unbeliever; Knox and the other writers I mentioned earlier often approached apologetics from this vantage point. But we are more than “thinking machines”, and Knox recognized that many intellectual questions are rooted in more existential realities. This comes across in his conferences to Catholic students at Oxford, in In Soft Garments and in The Hidden Stream. By the 1950s, Knox realized that mere logical defenses were not sufficient for many people. He was deeply affected by the invention and use of the Atomic Bomb, and his God and the Atom (regrettably, not in print) testifies to an important change in his priorities. He wanted to write “a new apologetics”, but did not get very far with it. His final illness from cancer took him very quickly. If I had to summarize the direction he seemed to be heading in his new approach, it would be this: the classical Catholic apologetics relied perhaps too much on pure logic, and most people are not purely logical. The dilemma was, then, what can be the common ground for a conversation between believer and unbeliever? His answer was ordinary human experience, which takes in the intellect but so much more: desire, beauty, heroic ideals, etc. In fact, Knox incorporated much of this “argumentation” in his sermons, which addressed not only the mind but the whole person. 3) Of all his works, many people believe to be his greatest achievement is his translation of the Vulgate. What are your thoughts on the Knox Bible? I think it was the work Knox himself was proudest of, and was a remarkable feat, especially given the fact that he did the translation singlehanded in wartime England, with all the limitations that entailed. He admitted that although there were people who liked him but did not like his translation, he would much prefer to have people not to like him but like his translation. The venture was star-crossed in several ways. He had squabbles with some of the bishops over the translation. He was not a biblical exegete himself, and had limited contact with Scripture scholars. When he took up the work, his friend C.C. Martindale was pleased because he thought that with his ability to write in a diversity of styles (witness Let Dons Delight, which captures the forms of English over several hundred years), Knox would be able to capture the different styles of diverse books of the Bible. But Knox himself was aiming at what he called “timeless English”: his idea was that his translation would be understandable by readers not only today but in the past. He also wanted the Old Testament to have a slightly archaic flavor to it. And of course he was translating the Latin Vulgate, and soon after his work was completed the Church permitted biblical translations from the original Greek and Hebrew. The result, in my opinion (and I am certainly no biblical expert), is a translation that is very beautiful in places, but in others it strikes a contemporary ear as rather idiosyncratic. His English is elegant, which is a welcome change from some of the more “breezy” translations that have been produced in recent years. 4) Why should someone today, with all the translations available, consider reading regularly from the Knox Bible? 2. Even those who did not fully embrace his translation when it came out acknowledged that his translation of the Epistles of St. Paul was masterly. 3. Knox had a facile mind, and one example of this in his translation was his ability to take passages in the Psalms and the end of the Book of Proverbs which in Hebrew were “abecedarian” (that is, each verse began with a different letter of the alphabet) and do the same in English. A tour de force! 4. Knox was not a biblical exegete, but he had a profound knowledge of the Scriptures especially because of his upbringing in an evangelical Anglican family. One biblical scholar compared Knox to the amateur detective (and remember, he wrote detective stories and was a colleague of Agatha Christie, Dorothy Sayers and others), who spots the clues that the Scotland Yard professionals (i.e., biblical scholars) overlook. His translation and commentaries would not pass muster as “scientific” exegesis, but he does bring out many spiritual insights in the text. And, after all, there should be a place for that kind of scholarship. Knox produced a commentary on the New Testament, and it would be wonderful if some publisher would produce his New Testament translation with the commentary on the bottom of the page, which had been his original intent. In sum, I would recommend reading Knox’s translation along with others because he opens a window that provides freshness to texts which can become stale when read frequently. It is the work of a man who was deeply imbued with a love of the Bible, saw it as a whole, and sought to make its words resonate in the heart. 5) Unlike some of the great English writers of the twentieth century, like Chesterton, Tolkien, and Lewis among others, Knox has not seemed to have had the same size of following today like the others. Why do you think that is the case? Thanks in part to the remarkable work of Sheed & Ward, Ronald Knox’s writings were very popular both in England and here in America from the 1930s until the early 1960s. A lot happened in the sixties (to put it mildly!) – many Catholic publishers disappeared and avowedly Catholic writers went into eclipse, in part I believe because “ecumenism” seemed to make it somehow poor taste to speak about Catholic particularity. (In fact, I think convert authors like Knox can be truly helpful to the ecumenical movement because they bridge the divide.) There was also a general “dumbing down” in Catholic education, most dramatically seen in the collapse of the entire catechetical enterprise of the Church. Doctrine was out, good vibes were in. That reaction was in part due to the overemphasis on purely logical presentations of doctrine, which was a concern of Knox himself in his later years. Chesterton is always Chesterton, and is in a league of his own, so it is no surprise that his cork popped back up very soon. Lewis has enjoyed something of a Renaissance largely because of the interest shown him by American Evangelicals; and of course he is a remarkable writer, dealing with the basic tenets of “mere Christianity”. Tolkien stands on his own as a novelist and, although there are many theological themes in his works, they are not explicitly religious. In part Knox went into oblivion because his books were out of print, and that is thankfully changing. He tended to be a bit colloquial in his writing, so at times his allusions seem foreign in a culture different from that in which we wrote. Some of his writing is dated. But I would argue that much of it is not, and in fact he has much to offer contemporary readers. I associate him with C. S. Lewis in this way: Lewis is a more engaging writer, but Knox has more theological depth. Knox’s writings can serve as a good follow-up to those of Lewis, because Lewis does a good job presenting a very broad vision of Christian belief, but Knox fills in the landscape. 6) If a person wanted to get started reading Msgr. Knox, where would you advise him or her to start? I would offer a few suggestions, in part because it depends on who the reader is and what he or she is looking for. If you want a good introduction to the Catholic faith: The Creed in Slow Motion. These were originally talks he gave to schoolgirls during the Second World War. They are easy reading and accessible to young people. It is interesting to think of him spinning these out at the same time he was laboring on his translation of the Bible. For someone looking for a logical defense of basic apologetical questions like the existence of God and uniqueness of Jesus Christ, I would suggest The Belief of Catholics. The first half of the book presents a logical defense, the second half gives a sense of the mystery of Catholic life from the inside. The next step up as far as apologetics are concerned would be his university sermons: The Hidden Stream and In Soft Garments. All of the foregoing fall into the genre of apologetics. More importantly, I would urge everyone to read his sermons, which have been collected together into a large volume by Ignatius Press (Pastoral and Occasional Sermons). They make great spiritual reading, throughout the liturgical year, on the Eucharist, about the saints, indeed the whole of Catholic life. Knox was able to combine Scripture, theology, and personal experience in a gentle but compelling way. His retreat conferences are very good, although many are still out of print. Because Knox was so popular in the 1950s, many of his writings can be found second-hand. 7) Since this blog focuses on the importance of Scripture, I was wondering what your favorite verse of Scripture may be as translated by Msgr. Knox? Timothy, good interview! Good questions and very thoughtful responses. I may have to pickup his book. He certainly was a pretty good apologist. I'm a Catholic now because I happened to pick up 'The Belief of Catholics' 18 years ago.